HomeHDR and sIBL lighting libraries and store for 3D renderings and artwork. StoreHDR & sIBL library store for 3D renderings and applications. TutorialsHDR & sIBL 3D lighting tutorials for VRay renderings. QuestionsQuestions and answers for technical usage in 3D renderings, sIBL, and sales. AboutAbout our HDR photographic services and how to contact HDRSource 3D lighting and renderings. LegalUsage rights and terms for our 3D HDR lighting image products. This is in regards to reuse and copyrights. *Please note: this article below may be outdated but most of these techniques are probably still applicable. I will look into updating this as time permits. Using sIBL with Vray and 3dsmax is fairly straight-forward, however I’d like to mention a couple of tips and bugs to address concerning the latest Vray template for sIBL. Although it’s not completely important, I’m going to assume you know the basics of setting up 3dsmax and Vray for Linear Workflow (LWF.) If you are not familiar with LWF, you may want to read the beginning of my Basic Vray HDR Tutorial. I also mention some helpful, basic render settings at the end of that article. Last but not least, if you haven’t installed sIBL, you may want to read my article on sIBL installation and setup for 3dsmax. 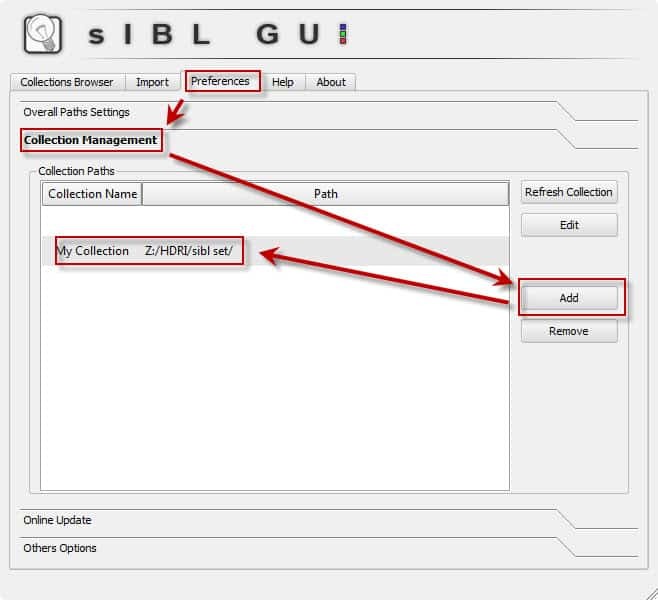 Using the sIBL Collection Path to Load Your Libraries. My sIBL files are located on a network drive mapped to Z. It doesn’t matter where you put your sIBLs as long as they’re accessible and the drive has enough storage space. 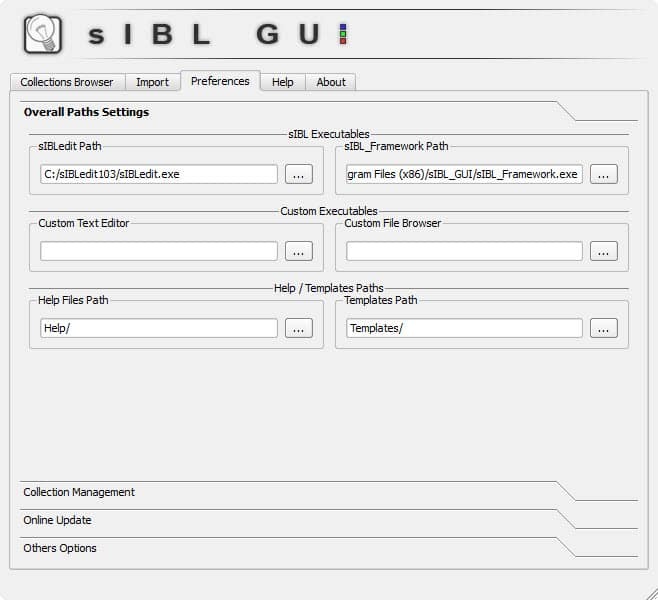 Overall Path Settings to Connect sIBL Executables. Selecting and Loading a sIBL HDR Set. 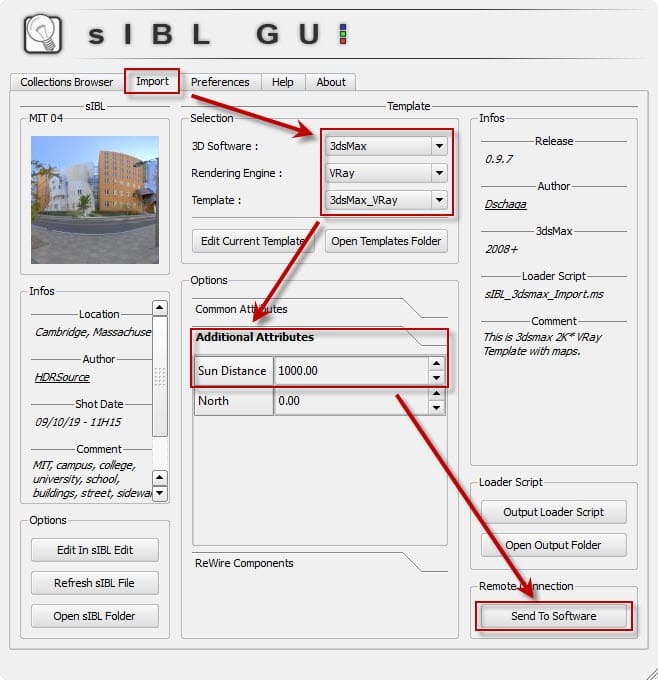 sIBL GUI Import and Export Steps. Important: Don’t forget to select your rendering software as sIBL defaults to Maya. I almost always adjust the ‘Sun Distance’ under ‘Additional Attributes’ to 1000. I find the default of “100.00” is often too small. This parameter controls the distance of a Vray light from the XYZ center of your scene. Vraylights will cast sharper shadows. If all works properly, sIBL GUI should automatically start up 3d Studio Max. Or, you could have had 3dsmax already opened with a scene already created. If successful, you may notice a new light in the viewport. Check the Vray and 3dsmax Environment overrides. Three files should be automatically populated. Finally, select the Vraylight (if added), uncheck “Affect Specularity”, and check “Invisible”. You probably wouldn’t want to see a strange ball of light floating in your scene. 1) If you don’t have Vray selected under the “Selection” area, you’ll receive a “Win32 OLE” error message. 2) The North parameter doesn’t seem to work yet for the Vray Template. Prior to sIBL GUI, the North parameter would rotate your environments around the center of your model. 3) When a sIBL file doesn’t have a “physical” light specified within the .ibl, the sIBL will not be sent to 3D Studio Max. This is a bug that needs to be fixed. I’ve added a light to all of my sIBL files, and in very dark scenes have specified a light with an extremely low multiplier (less than .0001) to get around this issue. A temporary solution would be to compare a working sIBL .ibl file with a non-working one in a text editor then copy and paste the working light settings at the bottom with a very low multiplier to get them to work again. 4) Since the recent release of version 2.0, sIBL supports multiple “physical” lights. 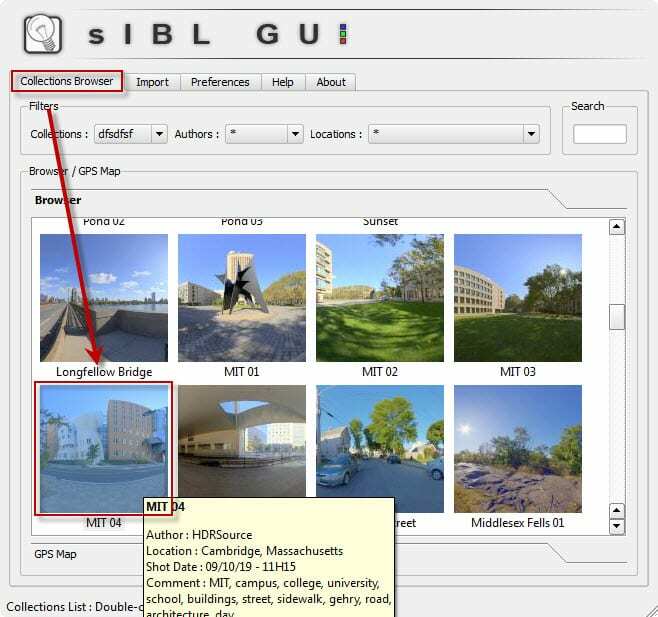 Unfortunately, if the sIBL .ibl file specifies the new light parameter as “LIGHT” instead of the original version 1.0 parameter called “SUN”, the sIBL file will not load. In order to fix this, I’ve specified all of my “Light” parameters to read “SUN” again. The “SUN” parameter is actually not deprecated and works properly. While my libraries all work properly, those of others may not. I’ve informed the other library makers of this issue. 5) If all of these issues listed above has not solved your issue and is still occurring with Vray and 3dsmax, you may still receive the “Win32 OLE error.” If this is the case, you may want to add the following registry information from the HDRLabs forum (as always, use at your own risk and backup your registry): www.hdrlabs.com.